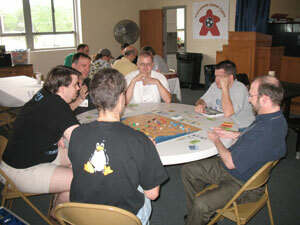 The third annual Tennessee Game Days occurred the first weekend May in 2008. This year's convention took place in the Fellowship Hall of the Donelson Christian Church. Attendance increased again this year, and 75 gamers from 7 different states made the trip to Nashville. The gaming started off on Friday at 9:00 a.m., and many people arrived bright and early to make the most of the weekend. There were quite a few late 2007 / early 2008 games in high demand on Friday, such as Brass, Galaxy Trucker, In the Year of the Dragon, Kingsburg, Pandemic, Wabash Cannonball, and Wealth of Nations. 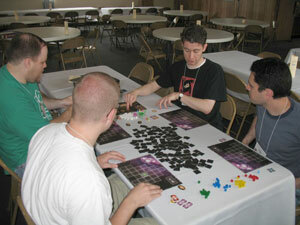 Additionally, many staples of the board gaming world saw quite a bit of play on the first day of the convention. 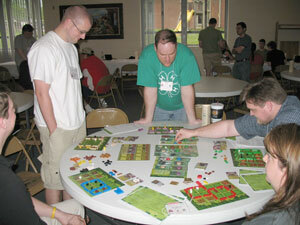 There were many games of Age of Steam, El Grande, Power Grid, and Settlers in action. 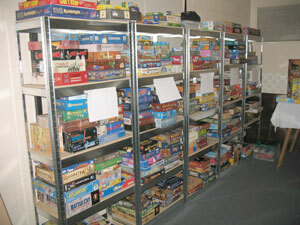 One group of gamers even embarked on a quest to play all of the Alea Big Box series of games over the course of the convention. They ultimately got sidetracked, but the first day started strong and saw them complete In the Year of the Dragon, Chinatown, Ra and Taj Mahal. Later Friday evening, the Wits & Wagers tournament took front stage. 14 teams of three participated in the tournament, so there were three total rounds played to determine the overall winners. 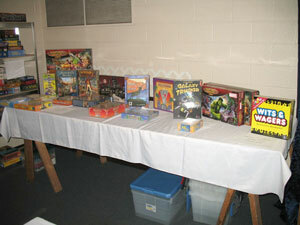 North Star Games provided three copies of Wits & Wagers to give away as prizes. This was definitely a high point for the evening, and it is on the schedule again for 2009. People started breaking out the party games after the Wits & Wagers tournament finished up. There was an especially raucous game of Dancing Eggs played late on Friday. Like Friday, Saturday began at 9:00 a.m. with many gamers champing at the bit for more gaming goodness. As this was the longest day most people had at the convention, it was no surprise to see the heavy games make their presence known. Some of the heavier games played on Saturday were Age of Empires III, Agricola, Antiquity, Brass, Liberté, and Napoleon's Triumph. The big event for Saturday was the Game-A-Thon competition. 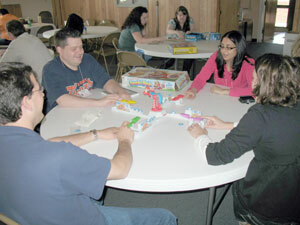 The Game-A-Thon encouraged people to log all of their games played from 11:00 a.m till 9:00 p.m. A formula for points was created which sought to reward playing well in a variety of games. When the dust settled, Brad Cowart finished first and took home a Heroscape collection, with second place, and Galaxy Trucker, going to Devon Weller. In addition to the more strategic, Euro-style games being played, there were a couple of kids games that made pretty decent splashes at this year's convention. The first of these, Loopin' Louie, should be no surprise to anyone. It's a staple at game conventions everywhere for it's super high fun-factor. The other kid's game that many people played over the weekend was Los Mampfos. This is a game about feeding donkeys different colored pellets, and then hoping to collect the most of each donkey poop color throughout the game. The game has great bits, and you actually get to push the food pellets into the mouths of the donkeys as the game progresses. Again, this game just has fun written all over it, and kids can usually beat the adults since it has a bit of a memory element to it. Sunday kicked off around 12:30 p.m. with the annual TGD Take It Easy Tournament. Around 24 people participated in the tournament this year. There were quite a few Take It Easy rookies in the crowd, but many of the veterans were able to get them up to speed quickly. Everyone seemed to enjoy the light hearted competition - look for the event in the same time slot for 2009! From there, most people brought out shorter games since many folks needed to travel back home later that afternoon. Some of the shorter games seen around the room on Sunday were Crokinole, Hornochsen, Race for the Galaxy, Space Dealer, and Ticket to Ride: The Card Game. While many people were content to play a few short games before heading home, there were quite a few hard-core gamers looking to play something meatier while they had the chance. The games favored by these attendees on Sunday were Age of Steam, Agricola, Cuba, Tigris and Euphrates and Through the Ages: The Story of Civilization. All in all, I had a great weekend and played a ton of fun games. Next year's event is June 5th through 7th - hope to see you there!